Abstract: On May 14 2002, the Montreal-based videocard manufacturer, Matrox, officially announced its newest technology - the Parhelia GPU. With the Parhelia GPU, Matrox introduces a new method of anti-aliasing to add to the ever growing list of AA techniques in use by ATI and nVidia called 16x Fragment anti-aliasing (FAA-16x). Anti-aliasing is the process of blending the colours of pixels on the edges of 3D objects in order to smooth their jagged appearance. The most popular current methods of anti-aliasing as instituted on Nvidia and ATI products are variations on the Full-Scene anti-aliasing technique (FSAA). With 2X or 4X FSAA, any given frame is rendered internally at twice or four times its original resolution in order to obtain two or four colour samples of each edge pixel (supersampling). These samples are then blended together when the scene is rendered back down to the output resolution, blurring the jagged lines and giving the illusion of a straight edge. 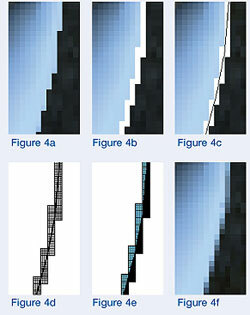 There are two disadvantages to this method of anti-aliasing. First of all, the performance hit involved in rendering every frame at up to four times its actual output resolution is considerable, and secondly, since the whole frame is being anti-aliased, some blurriness can result, especially in text. Fragment anti-aliasing is intended to avoid both of these disadvantages. 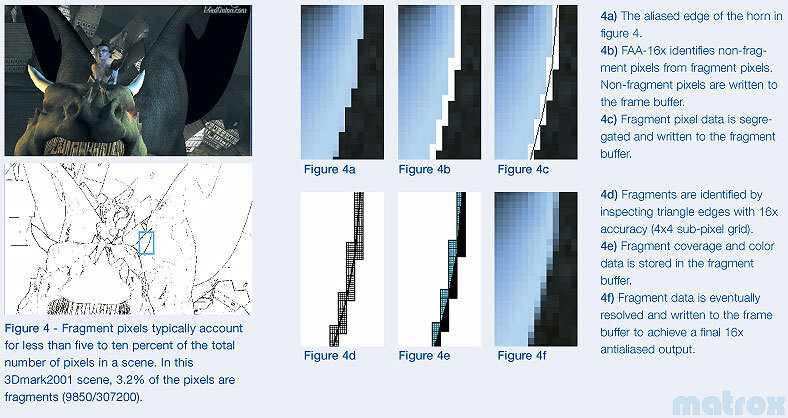 FAA-16x works by examining the edge pixels of each triangle for fragmented pixels (essentially pixels overlapping the edge of the object they are rendered onto), using 16x supersampling to break each pixel down into a 4x4 grid then determining which pixels lie partially outside the boundaries of the object. Data on the fragmented pixels is then written to a special fragment buffer, while the rest of the pixels go to the frame buffer, ready for output. Pixels in the fragment buffer are then anti-aliased using the same methods as FSAA except at 16x the original resolution, then written back to the frame buffer to achieve the anti-aliased output. Matrox claims that since only 5-10% of the pixels in any given frame will be fragmented, the performance hit will be minimal, and that the 16x supersampling, which would be completely impractical using the FSAA technique, will result in much higher image quality. The fact that only the edges of objects are being anti-aliased would also mean that blurriness should cease to be a problem. Of course, this also means that straight lines that are part of texture maps will not be anti-aliased, as they would be with FSAA… The Parhelia will also be capable of standard 4x FSAA should the FAA not work correctly on a particular application.